Half Yearly meeting report on Latest News page. Static Frame passes its tests and is approved!! See the Construction Progress page for full details and photos of the latest manufacturing progress. 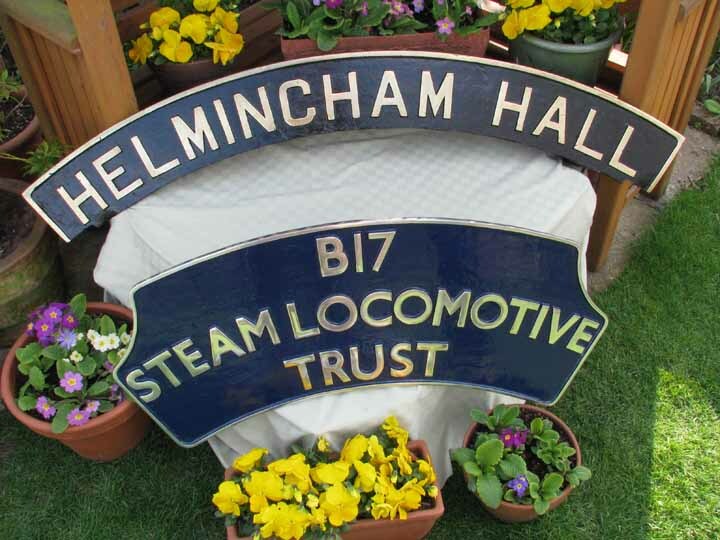 The B17 Steam Locomotive Trust is now the proud owner of a 'Helmingham Hall' nameplate thanks to a very generous donation - see Latest News page for more information and pictures. Beautifully restored - the Helmingham Hall nameplate and the Trust's locomotive headboard. The 'Spoke in my Wheel' campaign has now funded 3 wheels and well on the way to the fourth!! The 3rd wheel was achieved in record time. Our thanks to all those who have donated to this appeal. Members Page - now showing a Streamlined OO gauge model. 2019 - Help celebrate the 90th anniversary when the first ten class B17 locomotives entered revenue earning service in 1929 - numerous events around the East Anglia region during the year. For news of the Trust's involvement in a STEM pilot for schools, the latest project news involving tenders and a report on the September 2018 AGM, go to Latest News. By the late 1920s the LNER had recognised that the fleet of existing engines which had been in service from the start of the 20thcentury was in need of replacement with more powerful locomotives to cope with the introduction of heavier and faster express passenger services. Restrictions to axle load and physical length could not be satisfactorily resolved by the LNER design teams. 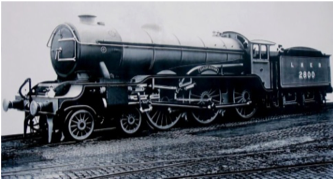 As a consequence, the LNER placed an order for the detailed design and production of the first ten locomotives with the North British Locomotive Co. (Glasgow) in early 1928, to be delivered by the end of that year. All 10 locomotives were delivered within the contract time to the LNER’s Eastfield depot in Glasgow from where running in trials were conducted. These engines were then allocated to depots to commence revenue earning service. First of class No. 2800 was named 'Sandringham' following the consent of King George V and in honour of the monarch’s country home in Norfolk. Within the first few weeks of 1929, the new locomotives, named after prominent country houses in East Anglia, hauled the first services to Cambridge with demonstration runs to Norwich and Southend. Other regular duties involved the boat trains, the Hook Continental and the Flushing Continental between Harwich (Parkeston Quay) and Liverpool Street and the long-distance boat train between the same port and Liverpool Central known as the Continental. Currently LNER class B12 and B1 locomotives are operational in preservation, but none of the B17s survived the cutter's torch. The B17 is the missing link between the two and is the only 4-6-0 locomotive designed by Sir Nigel Gresley. Supporting The Project. Help fulfill the project aim to construct a new B17, to recreate again those exhilarating sights and sounds of a ‘Sandringham’ hard at work on the mainline at the head of its train and re-introduce something of our past heritage, for greater public benefit in years to come. Some photos are courtesy of the Eastern Daily Press Archives.